A year and a half after my first visit to Portland, Oregon, I was excited to find myself back in the city that seemed so approachable compared to LA. I quickly learned not to let locals know I wanted to move to their city, especially from California, unless I wanted to feel an undercurrent of angst – you know, that fear most people have in idyllic cities where one doesn’t want the housing prices to skyrocket or the population to escalate, any more than it already has. Portland continues to excite me for many reasons: tax-free shopping, fresh air, food trucks, no water bottles in hotel rooms (since you can drink from the tap), the city’s formidable food scene, and Portland’s enduring obsession with great coffee. Iconic Portland brands like Stumptown Coffee, Salt and Straw ice cream, Blue Star Donuts, and Will Leather Goods have infiltrated the Los Angeles retail market and have become commonplace names. This time we didn’t cruise Portlandia on a bike from our Hawthorne launching pad, but we stayed downtown at the upscale boutique Dossier Hotel. The newly opened 205-room hotel with a chic lobby and bar/restaurant offers a private club feel. Besides being centrally located, an added perk is the complimentary wine and beer happy hour if you happen to not be off on your own Oregon Trail escapades. Our plush grown-up room with glorious products from Lather included a grand bathroom with separate Jacuzzi-style tub, a heavenly bed, and brash iconic 1980’s images donning the room from photographer Slim Aarons, who as a friend and confidante of the jet set had access to capture and document their lives. Although Portland now offers a full bike share operation (by downloading the Biketown mobile app) with 100’s of stations in and around downtown, we chose to explore the city on foot. On Friday afternoon we started blazing our trail a block away from the hotel, where we stumbled upon a square of grounded food trucks (Alder Food Cart Pod) offering everything from Chinese pork dumplings, Boba or Bubble tea in countless flavors, a Mac n Cheese bar, pizza slices, Thai cuisine, and a plethora of Mediterranean options and gyros, even from Iraq. You cannot just try one thing here, so it’s helpful to make an eating plan. 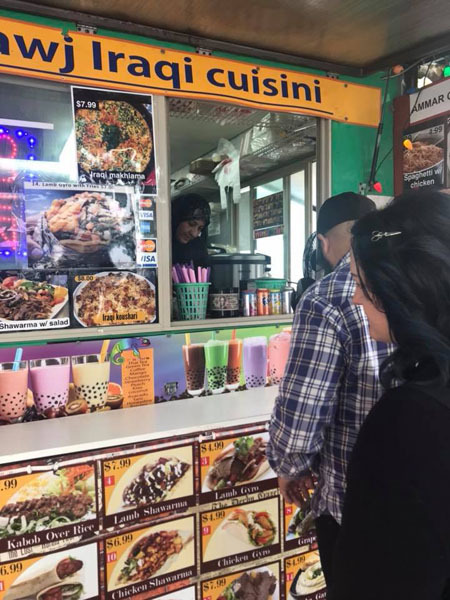 Savory and sweet crepes from BoomCrepes, mango sticky rice from Bang Saen, lamb gyro from Kafta House, and dumplings from Shanghai’s Best were at the top of my eating list. Our meandering journey took us by legendary Powell’s Books – with a long line of patiently waiting people proving physical books are far from dead, and into the store Made Here PDX for an interesting browse of unique, cool products all designed, built, branded, crafted, and made by Portland’s finest creators. A special gift designed, roasted, stitched, baked, welded, brewed, and/or built in Portlandia can easily be found here. Our trail led us down to Old Town Chinatown, where another line outside a grungy glitter building near the water with passersby carrying pink boxes let us know we had arrived at famed Voodoo Doughnut. In true tourist form we hopped in line and admired doughnut choices like bubble gum, bacon maple, and Cap’n Crunch cereal. I opted for vanilla glazed with fruitloops while my husband engulfed a (local favorite) chocolate glazed cream-filled delight. The next stop on our trail was the Lan Su Chinese Gardens, a small but impressively serene setting in the city, with a 40,000 square foot Ming Dynasty-style garden filled with tranquil pools and flowers all in bloom this spring. A small tea house offered a nice rest stop, while I gazed in awe as an elder Chinese man painted ornate calligraphy names with various bright colors of ink. After a home cooked meal at my sister in law’s new southwest suburban home in Lair Hill, we woke up early Saturday to seize the day, and I mean seize the food trail! We bee-lined it to the Portland Saturday Market under the Burnside Bridge near the waterfront to peruse all kinds of arts and crafts, jewelry, food, ciders, dog accessories, bath products, art, and other artisanal products. We sipped on lavender lemonade and left with sushi printed underwear for my husband who forgot his briefs at home, and funky small colorful gold earrings for me in shapes of flowers and animals. 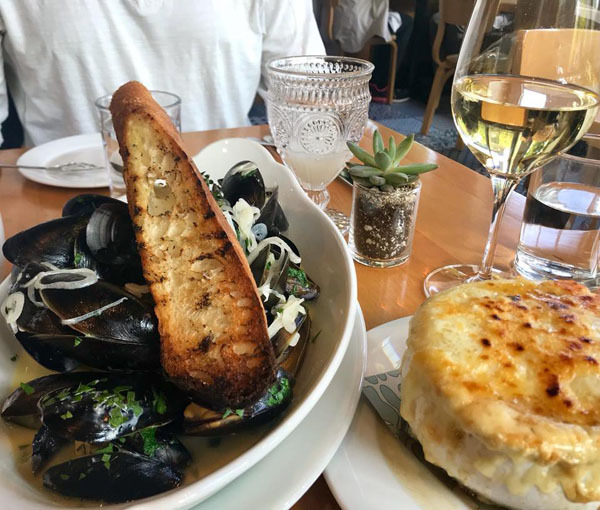 Next, a quick walk back to the downtown area lead us to Portland’s new popular French lunch spot, Bistro Agnes. This light-filled casual space is the result of Chef Greg and Gabi Denton, James Beard Award winners. Fully amazed by their absinthe bar at the back of the restaurant (since I hadn’t seen once since Prague), we indulged in flaming absinthe made in the traditional style and wine from the local Willamette Valley to accompany our French onion soup and juicy portion of mussels. The trail then led us a few miles uphill to Washington Park in search of the most authentic Japanese Gardens outside of Japan. If you want to find peace right above the city, hike on up to admire the roses gardens nearby and the new spring 2017 expansion. Stroll through the lush environment with five traditional garden landscapes. View cascading ponds, perfectly executed mini bonsai trees, and rock gardens raked in perfect symmetry reminiscent of the famous Ryoan-ji rock garden in Kyoto. Experience traditional Japanese activities, performances, and demonstrations. Grab a bite at the Umami Café, with its streamlined architectural lines features traditional sweet and savory snacks with Japanese teas and serene hillside views on the patio. As we meandered back down towards the city, we detoured to NW 23rd Street for shopping, restaurants, and recycled vintage fashion. I picked up a Hawaiian dress for my next trip and a dress with foxes at one of the cute boutiques. Our legs were weary after clocking in about ten miles on our Portland “trail” so we grabbed a beer at Kell’s Brewery outside at one of their picnic tables for a quick break. After another rest break at our hotel, our trail continued with an Uber ride to Mt. Tabor in the Southeast, for a 4-course chef-chosen wine paired dinner at Coquine, a neighborhood haunt known as one of the best restaurants in Portland. 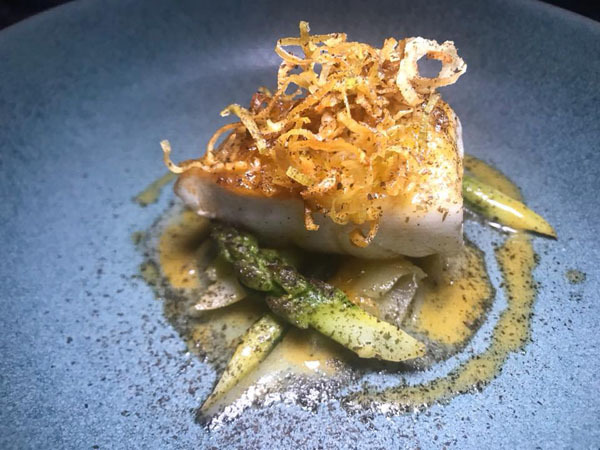 This little spot tantalized us with imaginative execution and seasonally influenced French fare thanks to Chef Katy Millard’s time working in Michelin starred restaurants. We sat at the bar while the sommelier (who we later figured out was the chef’s husband) poetically shared obscure and delightful wine choices to accompany each course with a beautiful verse about each bottle. Dishes like fancy roasted carrots, pan seared halibut with asparagus uni butter and crispy melty leeks, and black bean rubbed beef short rib were superb. After two exotic dessert options, Coquine rounded out our night with an impressive dessert and candy tray (i.e. homemade marshmallows, caramels, chocolate chip cookies) and we opted to take home a couple treats for later. The last Saturday eve stop on our trail was an underground cocktail bar downtown near our hotel called Pepe le Moko. Since we couldn’t get in the first night, we returned again, this time with reservations. An oyster shucker was working near the host stand and once down below, one might think we were at a bunker-type speakeasy in NYC. We squished into a corner table to imbibe on tasty cocktails, like the grasshopper, and struck up a conversation about our love for Portland with the couple seated next to us who happened to be from Long Beach, CA. 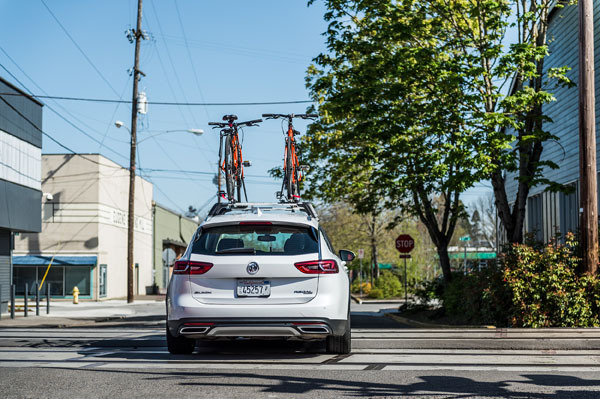 While locals love the easy access to wine country, the Columbia River Gorge, and Mount Hood, my Oregon trail was now taking me out of Portland in a new Buick Regal TourX, perfect for my active solo road trip adventures since it drove like a car but had the versatility of an SUV. 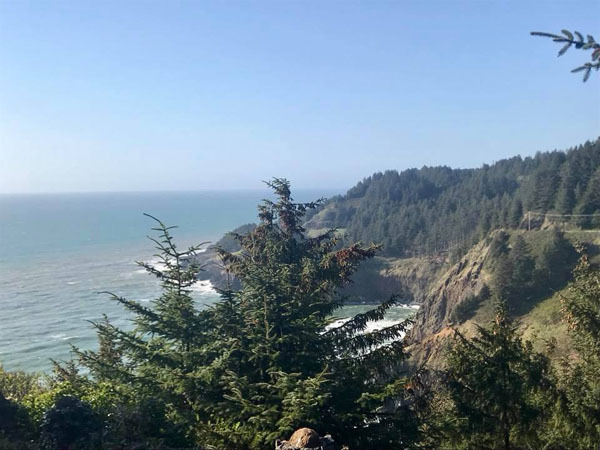 I headed toward the wild rugged Oregon coast and hopped out at various points to view the coastline and whipping ocean waves. Timber could be seen along the beaches for miles, perhaps brought down from the rivers. After several hours along the grand coastline, my Buick swept me inland from Newport past farmlands, cows, chickens, sheep, and even waterfalls trickling down to the sides of my car, where I made a pitstop at a local farm for fresh artichoke dip for the road. With a swipe of my feet under the back, I could easily open the trunk with my hands full. By 8 pm and with over 7 hours of touring, I arrived at the Ninkasi Brewing Company in Eugene, Oregon for dinner and tasty beers followed by a much-needed good night’s sleep at the Inn at 5th Hotel. The next morning, we drove to the Willamette River Trail after securing our bikes from Bicycle Way of Life on the aluminum roof rails with a few easy steps, and pedaled around this glorious river-scape, in awe of all the greenery. 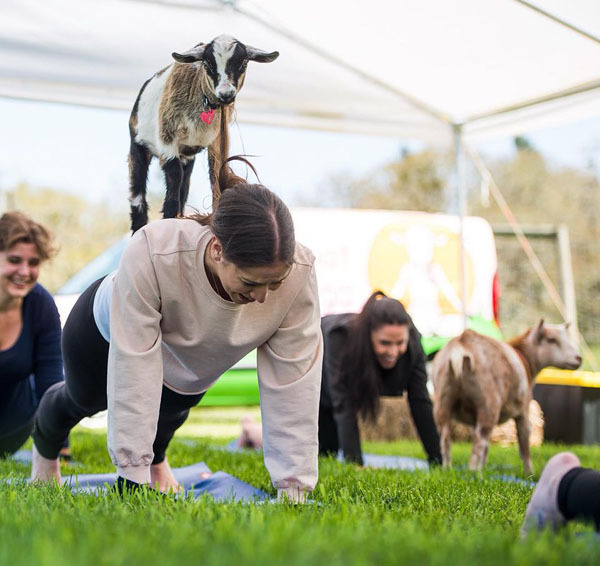 Our friends opted to try The Original Goat Yoga at Emerson’s Vineyard, where sweet baby goats hopped on their backs and nuzzled with them while holding their yoga poses. One of the final destinations on my Oregon Trail was about an hour north of Eugene. I passed numerous farms to find myself in Woodburn at the Wooden Shoe Tulip Farm where I pulled over to snap pics of the 40 acres of color waves. Snowy Mt. Hood was a surreal contrast in the background as I ran through the colorful tulip fields. My road trip went by quickly thanks to Apple CarPlay so I could make calls and listen to Spotify or Apple’s Chill station with a click of the touchscreen. 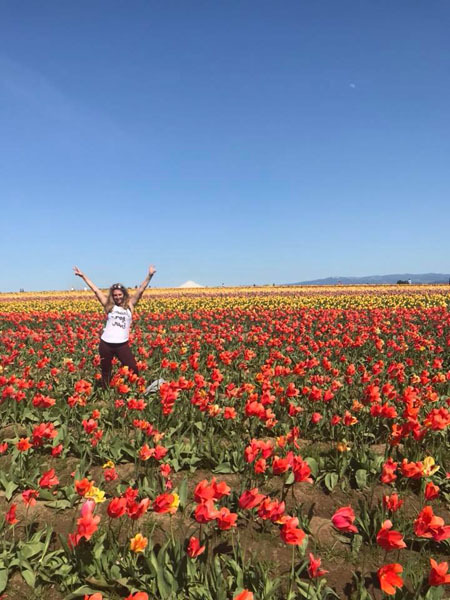 I didn’t want to leave this beautiful place, and the tulip farm country bliss on my Oregon Trail adventures had me almost miss my flight out of Portland, but I blazed through traffic in my trusty steed to get to the airport in the nick of time. Oregon is a great place to blaze your own trail – from hip and trendy Portland to the stunning coast and bucolic countryside. Bring your appetite and a sense of adventure. You may never want to leave.